“There is a difference between a statement of regret and an apology”. In January of 1989, Congressman John Conyers first introduced the bill H.R. 40, Commission to Study Reparation Proposals for African Americans Act. He has re-introduced HR 40 every Congress since 1989, and will continue to do so until it’s passed into law. One of the biggest challenges in discussing the issue of reparations in a political context is deciding how to have a national discussion without allowing the issue to polarize our party or our nation. The approach that I have advocated for over a decade has been for the federal government to undertake an official study of the impact of slavery on the social, political and economic life of our nation. Over 4 million Africans and their descendants were enslaved in the United States and its colonies from 1619 to 1865, and as a result, the United States was able to begin its grand place as the most prosperous country in the free world. It is un-controverted that African slaves were not compensated for their labor. More unclear however, is what the effects and remnants of this relationship have had on African-Americans and our nation from the time of emancipation through today. I chose the number of the bill, 40, as a symbol of the forty acres and a mule that the United States initially promised freed slaves. This unfulfilled promise and the serious devastation that slavery had on African-American lives has never been officially recognized by the United States Government. The commission would then make recommendations to Congress on appropriate remedies to redress the harm inflicted on living African Americans. The commission established would also shed light on the capture and procurement of slaves, the transport and sale of slaves, the treatment of slaves in the colonies and in the United States. It would examine the extent to which Federal and State governments in the U.S. supported the institution of slavery and examine federal and state laws that discriminated against freed African slaves from the end of the Civil War to the present. Many of the most pressing issues, which have heretofore not been broached on any broad scale, would be addressed. Issues such as the lingering negative effects of the institution of slavery, whether an apology is owed, whether compensation is warranted and, if so, in what form and who should eligible would also be delved into. H.R. 40 has strong grass roots support within the African American community, including major civil rights organizations, religious organizations, academic and civic groups from across the country. This support is very similar to the strong grassroots support that proceeded another legislative initiative: the Martin Luther King, Jr. Holiday bill. It took a full 15 years from the time I first introduced it on April 5, 1968 to its passage in the fall of 1983. Through most of those 15 years, the idea of a federal holiday honoring an African American civil rights leader was considered a radical idea. Like the King Holiday bill, we have seen the support for this bill increase each year. Today we have over 40 co-sponsors, more than at any time in the past. What is also encouraging is the dramatic increase in the number of supporters for the bill among Members of Congress who are not members of the Congressional Black Caucus. Just this past month my Colleague Tony Hall, from Ohio introduced a bill calling for an apology as well as the creation of a reparations commission. So now, for the first time we now have two bills in Congress that call for the creation of a commission. We are also encouraged by the support of city councils and other local jurisdiction that have supported our bill. Already the city councils in Detroit, Cleveland, Chicago and Atlanta have passed bills supporting H.R. 40. And just this past month a councilman in Los Angeles, the site of our 2000 convention has introduced a bill with the strong support of the Los Angeles community. Also, there are presently two bills in the Michigan State House of Representatives addressing the issue of reparations. It is a fact that slavery flourished in the United States and constituted an immoral and inhumane deprivation of African slaves’ lives, liberty and cultural heritage. As a result, millions of African Americans today continue to suffer great injustices. 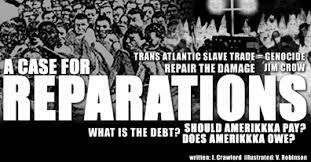 But reparation is a national and a global issue, which should be addressed in America and in the world. It is not limited to Black Americans in the US but is an issue for the many countries and villages in Africa, which were pilfered, and the many countries, which participated in the institution of slavery. Another reason that this bill has garnered so much resistance is because many people want to leave slavery in the past – they contend that slavery happened so long ago that it is hurtful and divisive to bring it up now. It’s too painful. But the concept of reparations is not a foreign idea to either the U.S. government or governments throughout the world. Though there is historical cognition for reparations and it is a term that is fairly well known in the international body politic, the question of reparations for African Americans remains unresolved. And so, just as we’ve discussed the Holocaust and Japanese internment camps, and to some extent the devastation that the colonists inflicted upon the Indians, we must talk about slavery and its continued effects.